The Princeton-Illinois Chapter was organized on April 13, 1896, by Mrs. Darlene Stevens Reeve, who established her claim as a Daughter of a patriot in 1890, under Miss Eugenia Washington. Thirteen ladies gathered at the home of Mrs. Laura Bryant, related by marriage to William Cullen Bryant, to organize the chapter of sixteen members. The chapter is named for our city, Princeton. Members preferred to call the chapter by the one name, but that name was unavailable so Princeton-Illinois Chapter was chosen. The town is named in honor of Princeton, New Jersey. Mary Pettegrew Keyes, member and Real Daughter, was honored each year on her birthday until her death in 1914. The chapter had given her a silver spoon, now displayed at the Bureau County Historical Museum. An oil painting of Mrs. Keyes is on display there as well. A DAR marker was placed by her grave in Princeton in April 1916. The grave of Real Daughter, Clarissa McManners, is also marked at Henry, Illinois. Graves of fourteen of our charter members have been marked by the chapter. The graves of the two remaining founders are out of state. Fourteen markers have been placed at the graves of Revolutionary soldiers, daughters, and wives. We have also placed markers to commemorate the Princeton speech by Abraham Lincoln and recognize the Owen Lovejoy Homestead and Underground Station. The chapter has planted two trees to commemorate special anniversaries and donated numerous books and U.S. flags. We will celebrate our 120th anniversary on April 13, 2016. The gavel belonging to the Princeton-Illinois Chapter was donated during the chapter year of 1912-1913 by Miss Fannie Mosely, one of our charter members. 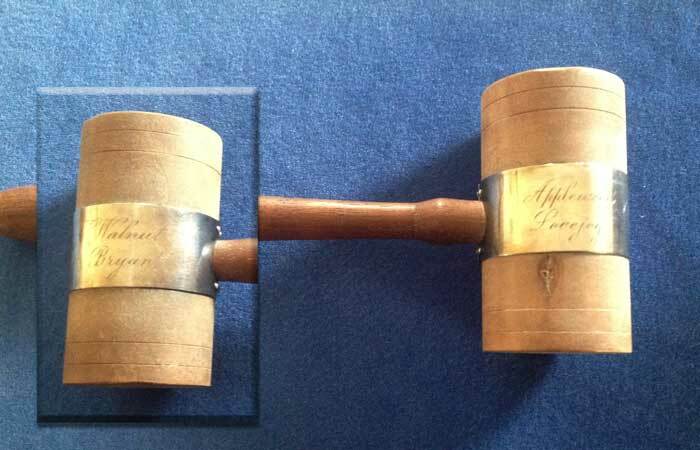 The gavel head is made of apple wood from the Lovejoy Homestead and Underground Station in Princeton and the walnut handle came from one of the homesteads of the Bryant brothers, early settlers of the Princeton prairie and brothers of William Cullen Bryant. A small metal plate on the gavel head states “DAR” and acknowledges the woods and donor names. The Princeton-Illinois Chapter donated three pieces of wood to the Illinois State Society’s block. One came from the first township high school in Illinois, another from the first court house in Bureau County (located in Princeton), and the last from an Underground Railroad Home near Tiskilwa, seven miles from Princeton. The donations of wood pieces occurred about 1938-1939.